This is a collection of glitches possible in Pikmin 2 and the New Play Control! port. Effects: Makes an object be carried faster than normal. How to: Get some leaf or bud Pikmin and spray them with ultra-spicy spray. Then, issue them onto the object you want to carry. It doesn't matter if they are holding on without moving, or if they are carrying it away. When the spray wears off, whistle the Pikmin back. The object will be "charged" with some extra speed value, making it get carried faster than normal. This can be repeated any number of times to increase the speed value more and more. Notes: When an object is being carried quickly enough, it can go up walls. An object that is "charged" a lot and is being carried by Pikmin stuck moving in a circle can have a massive jolt in a random direction when a carrier is added or removed. By repeatedly "charging" the Decorative Goo from inside the Blue Pikmin's den and manipulating these jolts, it is possible to have the object be carried over the gate. 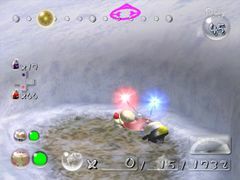 Since the speed value comes from a Pikmin changing its speed bonus mid-carry, a "charge" can also be obtained by having a Withering Blowhog attack flower carrier Pikmin (even if non-Purple Pikmin let go right after), or by having a leaf Pikmin carry something and get powered up by the flower power in 2-Player Battle. The latter will decrease the speed as opposed to increase it. Effects: Makes a Pikmin vanish instantly by being crushed. How to: When an enemy is defeated and falls to the ground, there is a chance that a nearby Pikmin will mysteriously vanish without leaving a spirit or making a sound. There are several enemies that have this happen more frequently than others, and it also happens with more regularity when swarming enemies rather than throwing Pikmin at them. It can also happen with pellets. Notes: This glitch can also happen in Pikmin. Possible explanation: When falling down, enemies will push any nearby Pikmin downwards and to the side. If the collision is just right, there's a chance that the downward push is too strong and the Pikmin falls to the ground, where it instantly dies shortly after. Effects: Duplicates the amount of sprays gained by absorbing a spray drop. How to: Find a droplet of spray, the color is irrelevant for the glitch. Dismiss all your Pikmin. Now you have to make it so that the leader you're not controlling starts absorbing the spray, and you absorb it as well before it's fully gone. The easiest way is to place one of your leaders close to the spray drop, then switch to the other leader and place him on the other side of the drop, so that both leaders and the drop are aligned. Call the idle leader, and just as he crosses the drop, dismiss. That leader should start absorbing, and before he finishes, touch the spray with your current leader. Alternate methods include pushing the idle leader into the drop, or running towards the drop at full speed with one leader, and just before he touches it, switch leaders; the momentum of the run should make him touch it. Notes: It is not possible to perform this glitch if the other leader is in your party, so dismissing is necessary. Possible explanation: The game is programmed to ignore all input from a leader that's absorbing a spray. That's why it's not normally possible to switch to another leader while absorbing. However, if a leader touches a drop without being the current leader, he'll still absorb it (but only if he's not on the other leader's group). The game increases the number of sprays whenever a leader finishes his absorbing animation. So if both leaders do it, the game increases it two times. Effects: Makes a non-Blue Pikmin swim for however long the glitch is done. How to: Non-Blue Pikmin drown after swimming for a while. If you have an idle Blue Pikmin grab the swimming Pikmin, the latter's swimming time will reset. You can call the Blue Pikmin to you in order to avoid having it throw the swimming Pikmin onto land, and you can continue doing this to cross any body of water. Notes: A similar glitch can also be done in Pikmin, but the method is different. Possible explanation: To make sure that a Blue Pikmin's rescue attempt is successful, as to prevent the player from being robbed out of a life save that seemed guaranteed, and in order to avoid having to deal with the Blue Pikmin carrying a Pikmin that's dying, the game resets the time the swimming Pikmin has left the second the Blue Pikmin grabs it. This prevents the swimming Pikmin from dying. If the throw is canceled, the Blue Pikmin will not throw the swimming Pikmin, but the latter's swimming time will still have been reset. To do: Get more info on this and place it on the bridge article, since it's not a glitch. Effects: Makes a bridge's 2nd+ sections be constructed instantly. Prerequisites: You should have visited this area before. How to: Start by making some Pikmin build the first section of the bridge. Then call all Pikmin to stop them from working on the bridge. Finally, proceed to issue them to work on the bridge again. Notes: When you're on an area for the first time, bridges are constructed like normal, no matter what. However, if you're coming back to the area, be it because you ended the day and came back or because you came out from a cave, it's possible to have the bridge unfurl quickly. Effects: Makes a leader able to go out of bounds, and teleport into a helpful spot, allowing shortcuts. How to: Send Pikmin to carry a treasure to the ship. While they're going, head for a seesaw block. The timing is very hard, but you have to try to make it so that the seesaw block your leader is on raises at the same time the treasure collection cutscene begins. After the cutscene is over, you will be inside the block. You can now go out of bounds or fall through the terrain, at which point you'll respawn somewhere near the ship. Notes: This trick can be used on the Perplexing Pool to go out of bounds and access the Shower Room without taking down the electric gates, and on the Awakening Wood to obtain Blue Pikmin early. Possible explanation: During the treasure collection cutscene, leaders and non-treasure-related Pikmin are frozen in place (enemies are not). This is to prevent disasters from happening while the player is unable to take action. Some objects continue to move though, such as the seesaw blocks. Because the leader's position doesn't move, but the block does, it engulfs the leader, and when the player takes control, they can fall out of bounds, as there are no walls in the small area in which the leader was left in. Leaders who fall out of bounds respawn in hardcoded places, specifically added for the scenario of a leader somehow falling off. Maybe the places weren't assigned with much attention, or maybe they made sense in earlier versions of the maps, as it's unlikely that Nintendo would want the default respawn places to be set up in such a way that players can easily take shortcuts. Effects: Makes a leader punch twice as fast. How to: Simply punch while moving. Rotating in place also works. You should attack roughly twice as fast as if you were standing still. Notes: This also applies to the Rocket Fist's extra punches. Possible explanation: Olimar/Louie's running animation speed depends on how fast he's moving. The punching animations get affected by this as well. Effects: Increases the number of Pikmin deaths without killing the corresponding Pikmin. Prerequisites: Be in a cave that has water, poison or fire hazards, and have Pikmin that are not immune to those hazards. How to: When your Pikmin are choking or burning due to a water, poison or fire hazard, their deaths are accounted for exactly when they make their last scream. While they are too far gone to save by the whistle at this point, they aren't exactly dead yet. If you go into a geyser or hole, you can see them jump into it with the bubbles, gas, or flames on them, albeit alive. On the next sublevel, they'll be perfectly normal. However, when you complete the cave, you'll notice that their deaths were accounted for in the number of total deaths. If you do it several times throughout the sublevels, you can even have over 100 deaths in a single cave run. Notes: This glitched number of deaths in the cave will also add to your Pikmin death save file total. It's also possible for a Pikmin to catch on fire during the cutscene, if there's a geyser nearby. But this will neither kill the Pikmin or change the death count. This can also rarely happen if Pikmin die from falling off an abyss. Possible explanation: The game counts a death when a Pikmin makes its last cry, even though the creature's object still exists on the map. Normally, it's impossible to save it when it's doing its last cry, though. But when entering a hole or a geyser, the game forces all Pikmin objects to jump in, regardless of their state. When loading the next sublevel, the game creates new Pikmin objects, basing itself on the previous objects' maturity, color, etc., but not their state (choking/burning). Demonstration of the glitch. The Pikmin on the bottom-left are very flat. Effects: Causes crushed Pikmin to appear in the sublevel transition cutscene. Prerequisites: Have something that is able to crush Pikmin on the sublevel, such as the Armored Cannon Larva in sublevel 3 of Subterranean Complex. How to: Be near a hole to the next sublevel in a cave, and have something on the floor that is able to squish Pikmin, such as a boulder. Have the Pikmin be squished by the object (or enemy) and enter the hole right afterwards. If you enter quickly enough, the squished Pikmin will be there in the cutscene, and will appear squished. Notes: The crushed Pikmin will not die when you arrive at the next sublevel, nor will they be counted for the total of deaths. Possible explanation: In caves, when the player enters the next sublevel, all living Pikmin that are not buried in the ground are automatically teleported to the leader. And, because Pikmin do not die instantly after they are crushed, there is a small window where the game considers them alive, which can be used to keep them alive in the cutscene. And because the cutscene doesn't expect the Pikmin to be different from normal, it doesn't fix the fact that they are squashed, thus, making them appear flat in the cutscene. Effects: Makes the game announce a Pikmin extinction, without any single Pikmin death. How to: Go near the entrance of a cave with Pikmin on your party. When you're ready, press / and / at the same time, preferably the dismiss button slightly before. The cave chart will say you have all the Pikmin with you, but they should be idle. Confirm that you wish to enter the cave. After the falling cutscene, the game should announce a Pikmin extinction. Notes: Because no Pikmin died, it will not affect the total number of Pikmin deaths. When you return to the overworld, all the Pikmin will be inside the Onions and Ship. What would happen normally: The game should recognize that no Pikmin will enter, and claim it's too dangerous to go in without any Pikmin. Possible explanation: For each frame, the code to dismiss the Pikmin comes after the code that updates their counter. As such, when the game is paused by the cave entering confirmation dialog box, it processes only what happened on that frame. And on that frame, the game tried to update the counter: all Pikmin are still in the party, so the counter indicates over 0 Pikmin (and the message box uses this value as well). However, after the counter updater code comes the dismiss code. Because the dismiss button was pressed on that frame as well, the game runs the code that dismisses all Pikmin and turns them pale. Normally, the game would update the counter on the next frame, but because the game is paused by the message box, the counter is only updated when the game returns to normal, i.e. when the cave exploration starts. When this happens, the game realizes there are 0 Pikmin and the player is inside a cave, so it triggers a Pikmin extinction. Effects: Makes a Blue Pikmin save a drowning non-Blue, through a bridge. Prerequisites: Have a built bridge and Blue Pikmin. How to: Leave some Blue Pikmin idle on top of a bridge. Then, throw some non-Blues under the Blue Pikmin. After a bit, the Blues will grab the drowning Pikmin through the bridge, and throw them to safety. Possible explanation: Normally, lifeguard Blue Pikmin that are close to drowning Pikmin don't have anything in between. As such, the check for whether a Blue Pikmin should rescue a drowning one doesn't take into account walls, objects or bridges. All that's needed is for the Blue and the drowning Pikmin to be close enough to one another. Effects: Makes non Blue Pikmin survive in water for a few seconds, allowing the player to retrieve treasures without Blues. How to: Simply trigger a cutscene that does not pause the game (like the sunset warning or a new cave). While the cutscene is playing, non-Blue Pikmin will ignore water. If timed right, you can retrieve treasures without Blues. The effects continue for a few seconds after the cutscene ends. If you trigger several cutscenes at once, you can keep the glitch going for longer. Effects: Makes a Pikmin become stuck under a bridge, without dying. Prerequisites: Have a partially built bridge that's close to the water, such as the one in the Awakening Wood near the Unmarked Spectralids or the one in the Perplexing Pool, near the Citadel of Spiders. How to: There are two ways for the glitch to happen. One way is to throw Purple Pikmin on top of Sheargrubs (Awakening Wood) or a Cloaking Burrow-nit (Wistful Wild) that are chewing at a bridge that is not fully constructed. If you did it right, the Pikmin and carcass will fall through the bridge and onto the water, sometimes the former will stand on top of the latter, and not drown. Something similar can also happen with a Yellow Wollywog, on the Perplexing Pool, though the creature will remain on top of the bridge. The second way to pull off the glitch is when a non-Blue Pikmin "swims" underneath a bridge, or if the bridge is constructed on top of them. Notes: To release the stuck Pikmin, you should push them with your leader, as they cannot be whistled. Wollywogs and Yellow Wollywogs can also get stuck under bridges in the same way; this too is rare. Possible explanation: Deconstructed bridge sections have collision data that's sub-optimal, because they're meant to be temporary things. As such, collisions that involve bridge sections sometimes fail. Pikmin can survive drowning because, again, the bridge section's poor collision makes the game consider them as being out of the water. Low Harmful Pikmin 2: ? Effects: Makes a Pikmin vanish, but not die, by going through a bridge. Prerequisites: Have a built bridge being eaten by Sheargrubs. How to: Throw a Pikmin onto a bridge that's being deconstructed by Sheargrubs. If you're lucky, it might mysteriously disappear from the screen. Notes: The Pikmin will still be counted on the counter and appear on the radar as their respective colors, but will not appear above or below the bridge. Corpses and pellets, however, will still be on the bridge. Possible explanation: As with other bridge-related glitches, bridges are objects, not level geometry, so their collision detection is inferior. In addition, by having the Sheargrubs eat the bridge, it's possible for ground that used to be under the Pikmin to suddenly stop existing, which makes the game behave erratically. Effects: Makes a Purple Pikmin stuck to a Dwarf Bulborb teleport to the leader's hand, or be thrown while still stuck to the enemy. How to: Simply throw a Purple Pikmin at a Dwarf Red Bulborb, Dwarf Orange Bulborb, Snow Bulborb, or Dwarf Bulbear such that it crushes the enemy instantly. The Purple Pikmin will stay stuck to the enemy for a couple of seconds. During this time, whistle the Pikmin, get close to it, and hold / to grab it. The Pikmin will be grabbed, as evidenced by the sound, but will not be in the leader's hand. The Pikmin will teleport to the leader's hand when the enemy's spirit shows up. This means that the player can keep the enemy off-camera, and only when the enemy is visible again will the Pikmin teleport to the leader. While the Pikmin is stuck, you can also release the button to throw it, but this will just make it spin in place on top of the enemy, and land right near it after a bit. This glitch also works if you switch to a different Pikmin in your group, and then use / to switch to a Purple Pikmin, while making sure that the stuck Purple is the closest one in the group. Effects: Makes a Pikmin that should have died stay alive, but untouchable and invincible. Prerequisites: Have a sublevel with a hazardous obstacle near the Research Pod and uncollected treasure. Have never seen the cutscene that plays for a suffering Pikmin of that hazard's type, in the current save file. How to: Collect a treasure, and during the cutscene, have the Pikmin touch a hazard whose cutscene has never played before. If you close the treasure collection cutscene at the right time, before the suffering Pikmin die, the game will resume to the Pikmin suffering cutscene, and afterwards, the Pikmin will stay alive, and impossible to interact with. Notes: The Pikmin will still count as a death, even though it still counts as existing, as proven by the Pikmin counter, and by the Pikmin that appear on the next sublevel or on the surface. Effects: Makes an Anode Beetle that is getting ready to connect to a partner instantly change from its idle animation to its "flip upright" animation, and suffer no effect from the Pikmin that hit it. How to: Throw a Pikmin at an Anode Beetle that has been roaming around. The glitch will happen if the Pikmin lands on the same frame in which the creature would begin turning to face its zapping partner. Notes: If the player triggers this glitch accidentally, they could end up not reacting to the still-active enemy in time, and could lose Pikmin. To rectify this, they can throw two Pikmin in a row, so the second one hits after the first one causes the glitch. What would happen normally: The creature would get flipped upside-down and become impossible to connect to a partner while in this state. Possible explanation: The variable that controls how much time is left until a flipped beetle gets back up is set to zero every time it enters the state where it is aligning with a partner. If the beetle enters that state at the same time it enters the "flip upside-down" state, the enemy will be successfully flipped, but the "time remaining" variable will be set to zero, and the enemy will flip upright straight after. Effects: Makes a Withering Blowhog stuck between the ground and water, endlessly repeating its falling animation. How to: Go to the Shower Room, and make it so that the Withering Blowhog near the landing site hovers between the ground and water as it stops to inhale. Then, make it fall. It should permanently repeat its falling animation. Possible explanation: The enemy only performs its landing animation when certain spots of its underside detect a ground. Effects: Makes a bomb-rock thrown by a Careening Dirigibug stay in place without detonating, and eventually disappearing. How to: Go on sublevel 6 of the Subterranean Complex and lure a Careening Dirigibug to you. Walk to the exit geyser, and stand between it and the ledge. With luck, the enemy will throw a bomb, but it will stay in place without exploding, between you and the geyser. Possible explanation: If the bomb is lodged between a geyser and a leader, it will stay there and won't touch the ground. The bombs are programmed to only explode when they touch the ground. Possibly as a safety measure to prevent object flooding, for scenarios like this, bomb-rocks were made to despawn after some seconds. Effects: Makes an enemy float in mid-air. How to: This glitch happens randomly. When you are close to an area where an enemy will fall down, it may fall on a dead enemy or treasure. This will make the enemy float in mid air, but it counts as being on the ground. Notes: If this happens with an Armored Cannon Beetle Larva, the boulder it shoots will fall down like if it was a cliff. Possible explanation: For collision purposes, enemies have long vertical hitboxes, probably a universal height. Normally, it's not possible to have an enemy fall on top of another, and the tall hitboxes is to make sure the enemy that's falling from above slides out of the way at a comfortable distance. If, however, the falling enemy is spot-on on the grounded enemy's center, it will have no direction to slide into, so it takes the collision as landing on solid ground. Effects: Makes a Wollywog be stuck in the ground, and invincible. Helpful for those who want to avoid the creature, harmful for those who want the Pokos it yields. How to: The timing is strict, but you must hit a Wollywog with a Purple Pikmin right as it starts jumping up. If done correctly, it should get trapped underground and become unable to move, as well as become invincible. Wollywogs can also become stuck for a variety of reasons, especially if their jumps make them land on top of other objects or oddly-shaped structures; this too makes them invincible unless they manage to land. Possible explanation: Wollywogs are only programmed to detect that they died when they're on the floor. Hitting a jumping Wollywog with a Purple Pikmin before it has left the ground makes it enter the "impact bounce" state, nullifying the jump. Because of the animation, the Wollywog gets slightly embedded under the ground, and is considered airborne. Because its momentum has stopped due to the Purple Pikmin stomps, it never lands, and so can never register the fact that it died. Medium Depends Pikmin 2: ? Effects: Causes the active leader to be stuck on a pipe and makes the player unable to switch leaders or move, until the Bumbling Snitchbug frees them. Prerequisites: Be in a sublevel with a Bumbling Snitchbug and fully-covered pipes (such as the corridor in the 6th sublevel of the Shower Room). How to: Walk into a fully-covered metal pipe where a Bumbling Snitchbug is flying under, and let the Bumbling Snitchbug catch you and throw you inside the pipe. Notes: The glitch cannot be undone unless the Bumbling Snitchbug picks up the leader again. Effects: Makes non-Red Pikmin ignore a Fiery Bulblax's flames. How to: Lure the enemy into the water, and when its fire goes out, toss non-Red Pikmin at its back. When it walks out of the water, its fire should return, but the Pikmin in its back should take no mind to the fire. Possible explanation: When the Bulblax leaves the water, there is no code to alert the Blue Pikmin that the object they're attacking has changed its elemental properties, so the Pikmin keep the old behavior – attacking, instead of the new one – being set ablaze. Effects: Makes a petrified Volatile Dweevil kill itself, yielding normal petrification death spoils. Prerequisites: Have at least one ultra-bitter spray. How to: Approach a Volatile Dweevil. Just as it's about to die, petrify it; the timing isn't too strict. If you did it correctly, the creature will have exploded, but the game will still have recognized your petrification, giving out a nectar or some sprays as a result. This removes the need to use Pikmin in order to kill a petrified Volatile Dweevil, but carries some danger, seeing as the explosion might cause damage. Notes: This can be done on the Piklopedia, but seeing as no nectars ever come out, it is as if the glitch hadn't happened at all. In the Japanese version's Piklopedia, the game freezes instead. Possible explanation: There's a point on the bomb-rock's explosion where it can no longer be petrified and has to explode; this happens a few frames before a normal explosion. During this point, petrification attempts will only turn the Dweevil into stone, but not the bomb-rock. Seeing as the explosive destroys the Dweevil, and seeing as the Dweevil is considered to be petrified, even if its petrification animation has just barely started, the game gives out nectars or sprays. Particularly: Get more details about this. Effects: Makes a Dwarf Bulborb's animations temporarily speed up to roughly twice its normal speed, giving the player less time to react. Prerequisites: Have the Brute Knuckles. How to: Combo a Dwarf Bulborb using the Brute Knuckles. Occasionally, the Bulborb's shaking, biting and dying animations might be sped up. Notes: This can also happen with similar enemies, such as Dwarf Orange Bulborbs. Effects: Makes the Waterwraith's rollers unable to move, though the creature itself will still move. How to: Go on sublevel 4 of the Submerged Castle. Lure the Waterwraith into entering the large pipe area. It should get stuck fairly easily. Particularly: Get more info on this. Specifically, what happens if you beat up the treasure afterwards? New Play Control! Pikmin 2: ? Demonstration of the glitch, at 4:30. Effects: Makes a treasure re-appear in the Titan Dweevil's hands. How to: Beat up one of the Titan Dweevil's treasures until it's nearly detached. When the creature is just about to use that treasure, petrify it. Attack the treasure and detach it before the boss breaks free. Effects: Makes a Wollywog or Yellow Wollywog jump very far. How to: Get two leaders next to a Wollywog or Yellow Wollywog. Place them close enough that the creature will notice them, but not so close that it will jump. Keep one leader in this spot, and with the other leader, walk up to the Wollywog and spray it with ultra-bitter spray as soon as possible. The glitch will work so long as you spray the enemy before it starts its jump, but after it chose a target to jump to. Then, quickly run away with that same leader, preferably in a straight line. After enough time has passed for the petrification to wear off, switch back to the leader that's still close to the enemy. It should reactivate and perform a massive jump in the direction of the first leader. It is possible for it to travel any distance this way, but if it hits an obstacle or wall, it might stop short. Possible explanation: After a Wollywog decides its attack target, it will jump to above where the target is in a straight line. Normally, there's no risk of the enemy making a large jump, since a leader or Pikmin needs to be close by to be considered a target. But by petrifying, this gives the leader enough time to run away and create distance. The player must switch to a different leader that is standing next to the Wollywog because while it is off-camera, it will not be active, so it will not perform any jump. Effects: Keeps a Dweevil alive, but with 0 health remaining. How to: You have to try to make a Dweevil run out of health just when it picks up an object. If successful, the creature will be alive and carry the object around, while supposedly dead. Notes: To stop the glitch, make the Dweevil drop the object. A Dweevil in this state cannot be petrified, even though "normal" Dweevils that are carrying objects can. A similar "zombie" glitch also exists for the Pellet Posy. Possible explanation: When the Dweevil is in the "carrying object" state, the game assumes it's alive, regardless of its health. Normally, it can only enter this state if it's alive, and while on this state, it cannot be hurt. However, with precise timing, it can pick up an object at the same time it loses its last bit of health. If so, the game doesn't kill it, because it's entering the "carrying object" state (it's crouching down to pick it up). Effects: Keeps a Pellet Posy alive, but with 0 health remaining. How to: Have a Pikmin attack a Pellet Posy from the ground. Make it so that, when the Pikmin jumps to the plant's stem, it pummels it an even number of times. If the last hit were to cause the Posy to fall, it will instead stay alive with 0 health. Whistle the Pikmin at this point to keep the plant that way, otherwise the Pikmin will kill it. A consistent way to do this is to throw a non-Red and non-Purple Pikmin near a Pellet Posy, let it attack once while on the ground, let it attack a few times after it latches on by itself, and whistle the Pikmin just as the plant's health goes to 0. Notes: Only the number of "pummel while latched" hits counts for this. To count the number of hits, follow the health wheel's drops, and not the Pikmin's actions. A similar "zombie" glitch also exists for the common Dweevils. Effects: Makes the Treasure Gauge's needle point directly upwards, for a split second, and gives the gauge its color, if it was previously black-and-white. Prerequisites: Have collected the Prototype Detector. How to: Pause the game. After you press / to unpause, rapidly mash / so that you switch leaders as soon as possible. If you managed to press the button at the right time, the needle will be stuck for the duration of the leader transition. If the Treasure Gauge was in black-and-white, it will have gained color. Notes: The needle gets fixed when the leader transition ends, and the coloring gets fixed when you pause again, or when you leave the area or the game. There are 2 frames in which pressing the leader button will trigger the glitch, and these are the first frames in which changing is possible after an unpause. If an Antenna Beetle is present, the gauge will have the needle pointing up, and will not have the purple effect, but when the needle gets unfrozen, the purple effect starts and the gauge starts acting normal. Possible explanation: The Treasure Gauge, along with the other normal HUD items, gets loaded and set to an initial state when the player unpauses. The Treasure Gauge's initial state is colored, and has the needle pointing directly up. The needle is updated every frame, except when a leader transition is occurring, so if the player manages to switch leaders while the Treasure Gauge is still in its initial state, it will stay that way until the transition is over. As for the coloring, it is only updated when a treasure is collected, when the area is left, when an Antenna Beetle dies, or when the game is paused and unpaused, so it stays colored until one of these updates happen. Main article: Cave#Cave entrance leader mixup. When entering the first sublevel of a cave, the game may or may not switch the player's active leader. It depends on the last leader the player used to jump to a non-first sublevel. Effects: Makes a leader be inside the hole/geyser model. Prerequisites: Have The Key to the current Challenge Mode level uncollected. How to: Place a leader in the center of the spot where the hole to the next sublevel will appear (or the exit geyser). Then, have the Pikmin deliver the Key. If you placed him in the correct spot, he should be inside the hole (or geyser). Notes: It's possible to walk out of the hole or geyser, but it's not possible to go back in. You can also place objects and Pikmin on the spot where the hole will spawn. 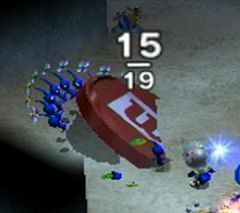 Treasures and enemies disappear and fall back down to the sublevel on top of the structure, and Pikmin are pushed out of the way. If the leader lies down where the hole will appear, he will fall from the sky above the hole after the Key's cutscene is over. Possible explanation: Collision between object A and B is only detected when an object A attempts to move from a position outside object B to a position inside it. If the initial position of A is already inside, no collision is detected, and hence, object A can remain inside B. Effects: Makes the "cash register" sound play twice, and makes the Poko value numbers pop out twice. How to: Enter a cave, and exit it by any means, with or without making monetary profit. On the Treasures Salvaged screen, wait for the list to scroll entirely. When the cash register sound plays and the numbers at the bottom pop out, press / . The sound should play a second time, and the numbers should pop out once again. Possible explanation: Pressing / makes the game skip the listing, and go directly to the register sound and number pop out. The code for this is simple; instead of literally skipping past the list's scrolling, it just fully scrolls the list, plays the sound and animation, and marks the listing as "complete". Erroneously, the player can still press the button a second or so after the listing is completed normally, which results in the game running the code to "skip", playing the sound and animations a second time. High Harmless Pikmin 2: ? New Play Control! Pikmin 2: ? Effects: Makes the ship start the cutscenes that take place at the beginning of the third day start in the second day instead. Prerequisites: Be on the second day. How to: When you first enter the Emergence Cave, grow 9 Purple Pikmin and leave the cave using the geyser without collecting the Sphere Chart. Enter the cave again, grow 10 more Purples, leave without the treasure once more, and store the Purples on the ship's hull. Return to the cave once more. For the final time, leave without the globe, and when you reach the surface, the cutscenes that are meant to start on the third day (the ship informing about the Purples having been stored on its hull and how Olimar should've instructed Louie about the controls) will play on the current day instead. New Play Control! Pikmin 2: Yes Demonstration of the glitch at 4:29. Effects: Makes a Glowstem temporarily stuck, not emitting light. How to: Have a leader and some Pikmin near a Glowstem, and another leader a bit far away, facing away from the Glowstem. Make the Pikmin on the first leader's party bump against the Glowstem. After they touch it, quickly take them away from it and switch leaders. If the other leader was positioned sufficiently far, the Glowstem will be off-camera once the focus shifts onto the other leader. Then, walk with this leader towards the Glowstem. If the timing was right, it should remain disabled until it's touched once more. Notes: If Pikmin keep touching the Glowstem before switching to the other leader, once the Glowstem is back into view, it'll be updated. Low Helpful Pikmin 2: ? Effects: Makes a cherry float and go to an Onion by itself. How to: Go into 2-Player Battle mode. Have a Pikmin grab a cherry near a dead enemy's carcass. The Pikmin will grab the cherry and start to take it right through the carcass. The Pikmin will get stuck in front of the carcass, walking endlessly until the cherry enters the Onion. Meanwhile, the cherry will continue to move without any Pikmin carrying it. Effects: Makes nectar float in mid-air. How to: Cause a drop of nectar, such as one from a petrified enemy, to fall on top of a pile of sticks used to build a bridge. If the sticks are removed from under the drop by building the bridge, the drop will remain suspended in the air. Pikmin can be made to drink the nectar by throwing them at it, and they will fall back to the ground once the nectar is all used up. A good place to do this is in Awakening Wood with a Yellow Wollywog near the bridges. Effects: Leaves a leader's "ghost" following the active leader. This ghost can be harmed. Prerequisites: Have both leaders alive. How to: Have leader B follow leader A, and knock out leader B. Then, bring an enemy to its body. Inside a cave, his body is technically in the same spot he was knocked out at, except he turns invisible. Aboveground, the knocked out leader can be found near the ship. Then, get the enemy to do its "shaking" attack. This attack will be able to hurt the knocked out leader. He will then wake up and follow the active leader around. Inside a cave, he'll still be invisible, but you'll be able to see him aboveground. Either way, you can hear him walk, you can see his dust trails, you can hear him moan while idle, and every time he's damaged with a shake attack, you'll see sparks appearing and hear him grunt. If the leader that gets killed wasn't following another one, or if you dismiss him after the zombie state, it'll be impossible to have the glitched leader follow the living leader. In addition, dismissing will make him keep walking in whatever direction he was moving. Effects: Petrifies only half of the Volatile Dweevil. Prerequisites: Have the Volatile Dweevil on the Piklopedia. How to: Petrify the Volatile Dweevil on the Piklopedia. Right before it breaks free, petrify it again. If you did it correctly, only the bomb-rock on its back should've been petrified. An easy way to ensure the correct timing is to mash / when the creature is about to break free, and quickly stop the second it does. If you petrify it in this state, the creature itself will be turned into stone, but the bomb-rock will break free. Possible explanation: The bomb-rock and the creature must count as two different objects. They also react to the petrification at different times. With the right timing, their petrifications can be desynchronized. Effects: Makes a leader jump down a hole or enter the sunset cutscene whilst lying down. How to: If one of your leaders is knocked over by an enemy just as you are going in a hole, or the day is ending, he will enter the cutscene while lying down. This will not work if he lies down by himself with the Five-man Napsack. Possible explanation: When falling down the hole, the game sets the leaders' animation to be the "jump down hole" animation. However, if they're knocked down by an enemy after the animation's been set, the animation will be overwritten with the "fall down" animation. The jumping movement will still be correct, but the animation will not. Effects: Makes the sound that plays when you close the rules page on 2-Player Battle and Challenge Mode play more than once. How to: Simply open the rules page by pressing / , and mash / . Possible explanation: The B button is meant to close the page and play the appropriate sound. For such a simple and rarely-used system, although the game checks if the rules page is already closing (and if so, does not attempt to close it again), the same check was never implemented for the sound that plays. Demonstration of the glitch. The Dwarf Red Bulborbs behind the fire geyser aren't distorted, but the Clover to the right of it is. Effects: Makes a fire's heat haze effect shift from the place it should be. Prerequisites: Have the Wii version of the game run in widescreen mode. How to: If the camera is facing towards some fire, and said fire is horizontally centered on-screen, the heat haze will be on top of it like normal. However, if you rotate the camera or move the leader so that the fire is no longer horizontally centered, you'll see the heat haze effect move away from it. It can even disconnect from the fire entirely. Possible explanation: This is caused by an oversight while porting the game to Wii. The developers seemingly forgot to adjust the position of the heat haze in relation to the fire when converting the game to the new widescreen mode, thus causing the heat haze to be displaced. Effects: Makes the Waterwraith move around without using its running animation. How to: After destroying the Waterwraith's rollers, separate your leaders so that they're far apart from one another. One of them should be close to the running Waterwraith, while the other should be so far away that it cannot see the boss. Then, switch to the leader farther away and switch back to the leader closest to the Waterwraith. Notes: It's also possible to do the glitch with both leaders close to one another, but it is harder to achieve as the exact setup necessary is unknown. There have been reports of the creature becoming invulnerable and sliding permanently. It's stated that this likely happens if the Waterwraith's head collides with the Research Pod, and the amount of health it has decides whether or not it can be damaged. Possible explanation: Similarly to the way objects off the screen are less active, the Waterwraith's animations are frozen by being off-camera as well. Usually, the objects return to normal once they're in the scene again. In the case of this glitch however, some piece of unique code on the camera management for switching characters and a unique piece of code for the Waterwraith's animations pass through normal "off-camera" routines, and as such aren't managed correctly. This makes the Waterwraith's animations not continue when it's on-camera again. To do: Find somewhere else to put this, since it's not a glitch. Effects: Makes the inactive leader spin in place. Prerequisites: Have the large bridge in the Valley of Repose built. How to: Grab both leaders and head for the large bridge. Wait for the nearby Water Dumple to go under you. Then, dismiss your secondary leader and walk away. Possible explanation: Idle leaders look at enemies, without taking the altitude into account. When an enemy like a Water Dumple is placed under prey, it'll attempt to get near it, but because it cannot go up, it will never stop moving, as it will never reach it. Because of the way creatures move, the Water Dumple will spin in place under their target. If the target is an idle leader, they'll watch them rotate, and in doing so, will spin in place. Effects: Makes the Waterwraith's rollers petrified, leaving the creature struggling to break free. Prerequisites: Have the Waterwraith on the Piklopedia. How to: Open the Piklopedia, and go to the Waterwraith's archive. Right when you open it, repeatedly press / to petrify it. The rollers will become petrified, followed by the Waterwraith's body. The rollers will break free first. When they do, immediately re-petrify them. The Waterwraith will then break free, and appear to have a very difficult time trying to lift its petrified boulders. Possible explanation: Like with the half petrified Volatile Dweevil glitch, the rollers and the creature must count as two different objects, and their petrifications might be able to be desynchronized. Effects: Makes the first paper bag in the Valley of Repose stuck until the day is over. It'll act as it if were closed, i.e. it can still be passed through, although the cursor will stay on top of it when moved there. How to: Start a new save file and work your way until you have enough Pikmin to put down the first paper bag. Throw the required number of Pikmin but one onto the bag. When you throw the last one, call the Pikmin to either leader's side just as the Pikmin lands on the bag. Until you get the exact timing, it's better to whistle too early rather than too late, because if you whistle too late, the cutscene will start and you'll have to restart the save file to try again, whereas whistling too early makes the Pikmin come to you, and you can try again right away. If you timed it right, there's a chance the Pikmin will move out of the bag, and the latter will stay in place, but the reunion cutscene will still occur. Olimar and Louie will pass through the paper bag, and it'll be stuck in this state until the day ends. Notes: With incredible luck, it is also possible to have the "You appear to be stuck" cutscene interrupt the paper bag's deflation, which also triggers the glitch. Possible explanation: Just like the Cardboard box softlock glitch in Pikmin, if the Pikmin are brought back into the party just as the cutscene starts, there will be no Pikmin to actually perform the actions required by the cutscene, in this case, deflating the bag. Because it was never assumed that this could or would happen, the game is programmed to move Olimar and Louie to the place where the squashed bag was, regardless of its state. Effects: Makes the Pileated Snagret become stuck on the Piklopedia. Prerequisites: Have the Pileated Snagret on the Piklopedia. How to: On the area selection screen, place the ship over the Valley of Repose. Enter the Piklopedia and open the Pileated Snagret's file. The creature spawns on top of a snowy hill, but there's a chance that it will be unable to emerge from the ground, instead becoming stuck inside the patch of snow. If it doesn't happen, try making it burrow and emerge more often. It can also be able to move freely while inside the snow, and can be driven to fall into the pit by luring it with pikpik carrots. Another way to make it stuck is to lure it towards the part with grass; it might be unable to go back to its original place, all the while hopping endlessly while trying to go up the hill. Effects: Creates a miniature of a treasure on the top right of the screen. How to: It only happens rarely, but when you deliver a treasure, during the evaluation cutscene, a miniature of the same treasure might appear on the top right corner, in the background. Effects: Makes a leader stay on the ground instead of being beamed up by the Research Pod. The animations will still go through, and the teleportation flash will still happen, but the leader will remain on the ground. Prerequisites: Have Challenge Mode unlocked. How to: Go to any Challenge Mode level with enemies that can knock a leader down onto the ground. Make it so that an enemy or bomb-rock is about to attack your leader(s). Around 3/4 of a second before the attack connects, pause and pick "Give Up". The timing is very strict, so be willing to try several times. For reference, on the Secret Testing Range, you should pause just when the Gatling Groink's projectiles start descending. Possible explanation: The game is programmed to set the leaders' animations/states to "sigh and be sucked up", when the player gives up. Should something that makes an animation/state change happen on the exact frame in which the game ends the Challenge Mode run, like a leader being knocked onto the ground, the game will pick it over the normal animation, possibly because the list of animations is sorted so that the "get knocked down" animation has a higher priority. Effects: Makes a Ranging Bloyster's antenna flash and emit waves even after death. How to: Fight the Ranging Bloyster, and have it perform its death animation off camera. Effects: Makes part of the world geometry cut off and get replaced with nothing. Prerequisites: Have the Wistful Wild, and open the access to the southeastern part of the map. How to: Go to the Wistful Wild and make your way to the section with the Creeping Chrysanthemums and Withering Blowhogs. Climb up to the top of the northernmost tree trunk (the easternmost point of the map you can reach with a leader), and face the entrance to the Dream Den. Finally, angle the camera so that it is at a 3/4 angle view, and zoom it so that it is on the closest level of zoom. The geometry near the entrance to the cave should start cutting off as the camera gets closer to its final position. Possible explanation: In order to save the GPU load, the game stops rendering geometry after a certain distance. This distance is quite small at the closest zoom level. In-game, it's large enough so that the geometry doesn't cut off on-camera, but on that hill, the entrance to the cave is far enough away that the cut-off can actually be caught by the player. The camera's angle also takes a roll in this, in that normally, the 3/4 angle does not allow the player to see substantially far ahead to begin with. New Play Control! Pikmin 2: Yes Demonstration of a use of the glitch, at 8:44. Effects: Makes the leader jump quite high in the air. How to: When / is held, the leader makes a small bounce before lying down. If this bounce happens just as a boulder lands on the leader, there's a chance he might jump quite high in the air. The easiest way to pull it off is to enter the Cave of Pain. You should hold the button one and a half seconds after the shadow of the boulder appears. If you get hurt, that means you have to press it sooner. If you just lie down, that means you pressed it too soon. For reference, check the timings on the notes. Notes: This trick can be used to jump over some obstacles. The further away from the center of the boulder, the farther the distance of the jump. The closer to the center of the timing window you start lying down, the higher the jump. Via testing, it's concluded that the button must be pressed between the 41st frame after the the shadow appears (40 frames of the shadow's existence) and the 46th (45 frames of the shadow's existence). This results in a window of 6 frames. If you make the leader wake up, he will lose all of his momentum and fall to the ground, without you being able to control his descent. Possible explanation: The small bounce a leader makes must be programmed as an actual, physics-abiding jump, instead of a simple animation. This would explain why when something that's meant to cause knockback interferes with a jump makes a glitchy jump happen, as the game wasn't ready to handle that particular scenario. Alternately, it has to do with how the leader should've been knocked back, but the Napsack partially stops that, and blocks all damage, again, causing confusion in the physics engine. Effects: Makes Pikmin or a leader go through a bridge, and occasionally, through the ground surrounding the bridge. Leaders that fall off the level can teleport to helpful locations, but Pikmin die. Prerequisites: Have one of the bridges where the glitch works fully built. How to: In the corners of some bridges, like the South corner of the bridge at the West of the landing site, in the Awakening Wood, if you or a Pikmin goes under the bridge and tries to press against the wall on the corner, they might pass through the bridge and be placed on top of it. In addition, throwing Pikmin while below the bridge, while near the glitchy wall, will instantly place them on top of it. Finally, there are reports of leaders and Pikmin falling through the floor when attempting to pass through the corner; this seems to be a lot rarer. Possible explanation: The corner caused between the slanted edge of the pool and the bridge can cause the collision detection to fail, allowing passing through to the other side. Bridges are known to have poor collision detection to begin with. Medium Harmless Pikmin 2: ? Effects: Makes Louie be carried during a cutscene. Prerequisites: Have the King of Bugs uncollected. How to: Kill the Titan Dweevil for the first time. When you do, Louie will fall to the ground and a cutscene will start. At this point, / or / can be used to swarm or dismiss the Pikmin underneath Louie when he lands, and the Pikmin will carry him off the screen when the cutscene starts. Notes: Once the ship start speaking, the Pikmin will pause though. Low Harmless Pikmin 2: ? Effects: Causes two gates to appear in the same spot. If one gate is destroyed and Pikmin are thrown on the side where the other gate is, they will mysteriously land on the wall, and the other gate will come down. How to: Rarely, sublevel 7 of the Hole of Heroes, where the Ranging Bloyster is, will have two gates inside one another. If it doesn't happen, you can keep resetting until it does, since reloading the save file takes you to the same sublevel, but with a different layout. Possible explanation: Damage is caused to both gates at once, seeing as they're in the same position. However, because the Pikmin are actually "attached" to only one of the gates, only that gate falls down. When certain activities happen on the other gate, it gets updated, and when an update realizes the gate has 0 "health" remaining, it makes the gate drop down all in one go. Effects: Some objects can get embedded inside walls and other objects, making retrieving them impossible in some cases. How to: Occasionally, a treasure or a pellet can become partially embedded inside a wall or another object. It can be possible to move the object against the spot it's stuck in, though that can either set it free or burrow it deeper. Issuing Pikmin around these objects is sometimes pointless, as they'll be unable to distribute themselves correctly over it, and thus, be unable to carry it. In addition, if a Pikmin is latched on to or grabbing an object as it becomes embedded with a wall, if the Pikmin is whistled, it'll fall through and die. Effects: Makes a leader frozen or unusable. In Challenge Mode, make a leader stand where the hole to the next sublevel will appear (or the exit geyser). The leader might fall off the stage's boundaries when the object appears. In the Perplexing Pool or the Awakening Wood, use the seesaw block glitch. Then, there are two ways to trigger the glitch. With the solo leader method, you must time a hold of / such that the leader is in the middle of the lying down animation when he touches the pit. If you are successful, he will come back but without an antenna light, and the only action you can do is leave lying down mode. This will make him stand in place with his head held low, and stuck forever. With the two leader method, simply have one leader fall off the pit while lying down, and switch leaders afterwards, but before he touches the pit. You will be unable to switch back, and the frozen leader will either vanish, or be able to be carried, but frozen after being delivered. A different thing can happen if the leader touches the pit whilst carried by a Dweevil. He can be teleported to the Research Pod and become invisible, except for his antenna's light. In this state, he can be returned to normal by performing any action while controlling him, or by whistling him with another leader. 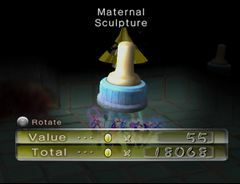 If a leader is on top of the Research Pod and the other leader performs other actions (like throwing Pikmin), the first leader will eventually appear on the ground somewhere, on the same semi-frozen state with no antenna light described above. The glitch can be fixed by ending the day, exiting the cave (or Challenge Mode level), or by going inside a cave or down a sublevel, using the non-frozen leader. A leader that is lying down without his beacon light and hasn't been recovered to the Research Pod or Onion yet will be able to be picked up by Dweevils. Trying to force the game to switch to the frozen leader, by letting the non-frozen one's health drop, for instance, will make the frozen leader stand up and freeze again; the HUD will be gone, and only the camera can be moved. Time still flows, and the sunset cutscene can be entered like normal. Effects: Makes the Hideous Victual slide away from its intended position, spawn partially inside the floor, etc. How to: There are no known ways to reproduce the glitches. Randomly, when entering sublevel 6 of the Glutton's Kitchen, the treasure can behave oddly. There have been reports of it sliding as it spawns, flying off, or becoming embedded in the ground. When it slides, it can even end up close to the starting location, or so far away that it can't be retrieved. It is possible that the problem happens because it spawns next to the Meat of Champions, even though that treasure rarely moves, and there are cases of weird Hideous Victual behavior without the Meat of Champions being involved. Medium Harmful Pikmin 2: ? Effects: Makes the Pikmin within a leader's group not come to the Onion at sunset. How to: Gather some Pikmin in your party, and whistle the other leader so that he's in your group as well. Move far away from the landing site, and wait until the day is about to end. Either time it so you switch leaders right when the sunset cutscene is about to start, or rapidly switch leaders and hope it happens. When the cutscene starts, some or all of the Pikmin in the group should count as left behind, despite being in the group. Possible explanation: When switching leaders while the two are together, the game makes all Pikmin in the current leader's group idle, switches the current leader, and calls the Pikmin to the new leader right away. The fact that the Pikmin do the "got called" animation supports this. The Pikmin only count as belonging to the group when they finish that animation, so between that time, they are technically idle. If the day ends during this time, they're treated like any other idle Pikmin, and get left behind. Effects: Makes the Pikmin take the wrong path when carrying a treasure. Prerequisites: Have the Geographic Projection or Air Brake uncollected. Have the bridge to the west of the Awakening Wood's landing site built. How to: Begin carrying the Geographic Projection or Air Brake. Once it reaches the middle of the bridge to the west of the landing site, whistle your Pikmin. Then, order them to carry it again. There is a chance they will start carrying it off the side of the bridge, and start climbing up walls. After a while, they eventually return to a normal path. Effects: Makes it so Pikmin cannot carry items, nor be affected by explosions and crushing. Makes one leader invulnerable to being hurt. How to: Enter any sublevel and have a leader ready to be killed. At the same time the final hit connects, pause the game. If timed correctly (which is hard, since it is a frame-perfect glitch), the game will pause at the same time the leader takes damage. On the pause menu, choose to leave the cave. The game will then return to the action, but instead of quitting the cave, it will show the leader's knockout cutscene with the pause menu on top of it. The gameplay will continue like normal, except for the menu. Your inputs here will reflect both the in-game action and the menu. You can quit out of the menu's question and leave the menu entirely to continue playing. If you use / or / to switch menu pages, the game will fade and continue with the "abandon cave" command, so be careful. If you leave the menu, you'll play like normal, except Pikmin won't be able to carry things, and your remaining leader will ignore enemy attacks and hazards. 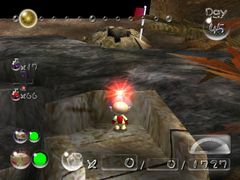 Carriable objects float a bit in the air, and this includes the leader; this can be used to go out of a metal cave's boundaries with the help of an enemy. If you do this, attempting the frozen leader glitch will make the leader float above the bottomless pit, and waking him up will make him continue his fall and respawn like normal. What would happen normally: The game should either not let the player pause the game until the leader's knockout cutscene starts and finishes, or it should actually leave the cave like normal. Possible explanation: Since the leader's knockout cutscene begins one frame after the leader receives the final point of damage, there is a one-frame window in which the player can pause so that the leader still takes the damage, but the cutscene doesn't start. By choosing to quit out, the game queues both the "leader is down" cutscene and the "escape the cave" command, and because this is a scenario that should never happen, the game stays in a semi-frozen state to prepare for the cave escape cutscene, where some things, like carrying, don't work. Effects: Makes you go out of bounds on garden-type sublevels. How to: Go to a sublevel that looks like an outside area (such as sublevel 2 of the Snagret Hole or the Brawl Yard), and have an enemy push you close to the boundary while you push into the same boundary. If done right, you will be flung to the outside of the walls and can explore out of bounds. The easiest way to do it is to use the Sniper Room, and finding the Orange Bulborb in a dead end, if it's there. Go on the boundary of the dead end, push through, and let the Bulborb bite you. It works a lot better if you time a press of / so that the leader lies down just as the creature takes a bite. Notes: If you go far enough away from the main part of the level, you will hit a massive wall with blurry images of trees and foliage painted on it, or in other cases an invisible barrier. Throwing Pikmin at this barrier will make them float in place for a while before falling to the ground. Possible explanation: Same reason as to why the embed glitch happens. Effects: Makes it possible to skip the partial control lockout that happens after a cutscene. In particular, when the player collects the final treasure in a sublevel and wants to enter the hole for the next sublevel, this can be used to skip the control lockout that stops the player from pressing / next to the hole, right after the treasure cutscene ends. This glitch can also be used with other cutscenes, like the one that plays when the first enemy is delivered to the Research Pod. How to: Right as a treasure is being delivered to the Research Pod, press / in front of the next sublevel's hole to interact with it. The screen should fade out due to the treasure's delivery, but the game will right afterwards ask if you want to delve deeper in the cave. 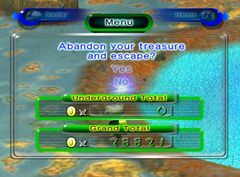 If you say yes, the game will then continue from the treasure cutscene, and afterwards, the cutscene where the leaders and Pikmin dive inside the hole will take place, with no interval between. Notes: At the end of the cave, the treasures that were used for this glitch will not be present on the tally, even though they will be considered collected and the all treasures ending can be achieved even if the glitch is used. In addition, because the treasures aren't tallied, the game won't consider that cave complete, which means the player can save time by not having to see the small cave completion celebration. To note however is that the player will not be given the Poko value for the treasures or objects involved with the glitch, and that there is the potential risk of the game freezing. Possible explanation: Starting the two events at once makes the game go through both of them right away, effectively skipping the small interval where the player is locked out from interacting with the hole. Because the game is in a non-expected state when the treasure is actually recovered, the entire process of registering its collection doesn't go through. Effects: Makes a gate able to be destroyed from the other side of a wall. How to: Occasionally, one of the posts that holds up a gate might protrude from an adjacent wall. You can issue your Pikmin to destroy the gate from the opposite side of the wall. Possible explanation: The randomly generated mazes have complex algorithms, in order to create lively and balanced labyrinths. This complexity can sometimes cause minor problems, like having a gate protrude from a wall. Because from the other side of the wall, the gate is still a normal "gate" object, it can also be targeted and hit by Pikmin. Effects: Makes a leader stay in his spray nectar absorption animation, with almost no way of getting out. Prerequisites: Have not discovered any spray nectar drop yet. How to: Place a leader near a spray nectar drop, but not so close that the discovery cutscene will begin. Then, place the other leader near it as well. When ready, have one leader whistle the other, such that the whistled leader will walk on top of the spray and begin absorbing it. With your current leader, walk towards the drop to discover it. If you timed it correctly, the drop will begin shrinking in the cutscene. The final step to get this glitch to work is to skip this cutscene before the drop is entirely gone. Approach too early, and the drop will stay the same size in the cutscene, and be absorbed like normal after the cutscene is done. This also happens if you let the cutscene go through. Approach too late, and the cutscene won't even begin. From here on out, the absorbing leader will be stuck, and your leader can join him too if you walk over the drop. There are very few ways to escape this state. Notes: When a leader is in its absorption state, it can be pushed by another leader, an enemy, or by carried objects, but not by Pikmin. A leader in this state is also invincible, except to an enemy's shaking animation. When stuck, it is only possible to move the camera and pause the game. Ending the day, either normally or through the pause menu, will correct the glitch. No matter what is done, that spray will never be added to the total count. This glitch is not possible in the New Play Control! version because the player cannot skip the cutscene. Effects: Makes an absorbed ultra-spicy spray drop increase the amount of ultra-bitter sprays instead. Prerequisites: Have an undefeated enemy and an ultra-spicy spray drop in the same area or sublevel. How to: This mostly happens accidentally, but it is possible to purposely trigger the glitch by following these steps: when you have an ultra-spicy spray drop ready to be absorbed, petrify a nearby enemy, and issue some Pikmin to attack it. When the creature is almost defeated, go collect the spray drop, but time it so that the enemy explodes just as the absorption is ending (i.e. just before the numbers on the HUD begin to change). One of the easiest ways to do this is to make the Iridescent Glint Beetle on the pot at the Awakening Wood release a spray drop, then use one of the nearby enemies. The window for the glitch is not very strict (7 frames), but timing the absorption with the defeat of the creature may prove difficult. Notes: If using the aforementioned method, the enemy you petrify and the spray drop can be at any distance from one another. If an ultra-bitter spray is absorbed instead, nothing special happens. This glitch also occurs if an egg breaks and reveals a nectar drop at about the same time a leader finishes drinking an ultra-spicy spray drop. In general, it seems like this glitch happens when nectar is revealed at about the same time as one obtains a spicy spray. Effects: Makes some objects become tilted. Can sometimes cause the object to fall through the map. Effects: Makes the game crash. Prerequisites: Have an uncollected treasure in story mode. How to: Make your Pikmin carry a treasure to the Research Pod in story mode. On the same frame in which the object gets delivered, pause the game. You know you got it right if the screen fades to black for a split-second before showing the regular pause menu. Then, choose to quit the cave. The game will show the treasure collection cutscene for a few seconds, although the treasure won't move, and will then crash. Possible explanation: The game is not ready to handle the event of the cave being abandoned at the exact same time it should show the delivery cutscene. It could be trying to play both at the same time, or play one of them while using the camera, assets, scripts, etc. loaded from the other, which leads to unexpected results. The following glitches are too insignificant to warrant their own section, or do not have enough details, but are included here for completion's sake. If a Purple Pikmin is thrown at a gate while very close to the gate, and is thrown at full force, it will go through and attack from the other side. Some obstacles (such as the paper bags) are surrounded by invisible walls to prevent the player from throwing Pikmin to the other side of the obstacle. However, even after crushing the obstacle in question, the invisible walls do not disappear. This glitch can also be reproduced with the cardboard boxes in Pikmin. 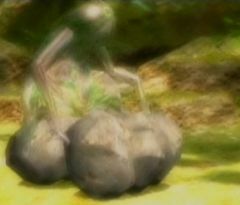 When Pikmin walk through a petrified Hermit Crawmad, without being issued to attack it, the creature will start taking damage, and can even be killed this way. If a Hermit Crawmad is petrified on land during its lunge attack, and is then dragged to the water, it will create the water splash effect even though it's not moving. If the enemy is killed in this state, the effect will stay there until the player exits the area or sublevel. Quitting a cave while Pikmin have been taken by a Candypop Bud, but before the new seeds are expelled, will make the Pikmin vanish. This will decrease the total Pikmin count, but won't increase the death counter. If Pikmin in a leader A's group touches fire, or any other hazard, they will be burning up without technically leaving leader A's group. In this state, if leader B whistles leader A, this will count as all of leader A's Pikmin getting whistled, meaning that the Pikmin's fire will be put out, regardless of how far away that Pikmin is, and the fact that the whistle wasn't anywhere close to them. Petrifying a bomb rock just as it is about to blow up will make it disappear without harm. Killing a petrified Mamuta that had an Unmarked Spectralid resting on top of it, and then leaving the scene will make the Spectralid return to its original position, and land in mid-air. Petrifying an Emperor Bulblax as it is jumping, and then killing it in mid-air will cause the body to vanish, the health wheel to stay there, and a sound to repeat over and over. An Orange Bulborb can play its dying animation faster than normal, for no apparent reason. 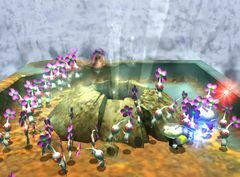 Surrounding a Wollywog in a large group of Pikmin can make it unable to decide which Pikmin to attack for several seconds. If a leader is holding a Purple Pikmin on top of a seesaw block, the Pikmin's weight will go from 10 to 2. A Pikmin that is drowning will be unable to be eaten. On top of that, when an enemy tries to eat it, it will just reset the Pikmin's drowning timer. In Challenge mode, have some Pikmin carry a treasure, and just as it is being beamed into the Research Pod, quit the level. The cutscene will initiate with the treasure still floating, smaller than its original size. This does not work with enemy carcasses, but can also be performed with cutscene-triggering treasures, but the timing involved makes it much harder. The walls next to the 35 Pikmin paper bag in the Valley of Repose actually wobble back and forth with the tree shadows. Given unknown circumstances, it is possible for Pikmin in a cave to attack a gate while quite far away from it, leaning on a wall. It might only happen if the gate is blocking off a dead end, and there is a room on the opposite side of the dead end's wall. If a Pikmin is latching on to a Yellow Wollywog, there is a chance that it will be crushed in mid-air. Rarely, a Pikmin may refuse to carry an object. Petrifying a Waterwraith while it is on top of large corpses or treasures will make it float around in a semi-random way. Given unknown circumstances, it's possible for a walking Armored Cannon Larva to turn into the buried version. This glitched buried version can also get stunned, unlike the regular buried version. Rarely, it is possible for a Burrowing Snagret or Pileated Snagret to live with 0 health. Damaging the creature in any way will end the glitch. In all of the metallic caves it is possible for your Pikmin to fall off the stage. This usually kills the Pikmin, but there are reports of that sometimes not happening. In caves like the Snagret Hole, there are solid walls. Behind these walls, you see nothing but black. If a Bumbling Snitchbug grabs one of the leaders, there is a chance that it will drop him into the void the walls are blocking out. If you fall in, you will reappear at the Research Pod. If a leader is hurt while held by a Bumbling Snitchbug (e.g. with an electrical wire), they will enter a state similar to as if they were on the ground. This means they can whistle, punch, etc. Making the leader lie down will result in him falling to the ground, sleeping, but after the Snitchbug attempts to throw, the leader will enter a "falling" state. In this state, they can't do much except be pushed around by other objects, and act as if there is no friction. Hitting a wall fixes this. Much like the Hideous Victual glitches, treasures can jump away seemingly at random, and even become unreachable in an unknown location. [dead link] This is likely due to the collision cylinders for both objects overlapping, and the game attempting to push them apart. Pikmin can sometimes bounce away after landing on an enemy. For unknown reasons, the Giant Breadbug can become immune to ultra-bitter sprays after it has bonked on the Research Pod as a treasure is collected. The game can crash in Glutton's Kitchen for unknown reasons. If a treasure is salvaged at the same time a debt repayment update message shows up on-screen, the game will softlock and enter a state similar to the treasure analysis state, but without the effects or HUD for it, and without the ability to close out. The player can still rotate the treasure around. The game can crash while trying to load Cavernous Abyss. There is one instance of a Dwarf Orange Bulborb instantly dying for no known reason. A plucked Pikmin can appear displaced above the Onion, for a second. A plucked Pikmin can fall through the floor shortly after being plucked. A Fiery Bulblax stunned by Purple Pikmin can have its health frozen in place for a while even while continuously getting attacked, and after the glitch wears off, its health will drop down to the value it should be at. Fighting a Pileated Snagret can cause a crash. Objects can fall through the floor seemingly without reason. If a Pikmin is holding on to it, it can fall too. Antenna Beetles struggling near thin walls can pass through them and fall out of bounds, into the pit. Creeping Chrysanthemums can freeze and refuse to change state. They can still be damaged, and bounce when they are. Breadbugs can sometimes dart forward when they grab an object, or when they are close to their den. Some treasures, in some circumstances, can become uncarriable by Pikmin. The Unspeakable Wonder can go under the floor next to its starting position, given unknown circumstances. It will be carried by the Pikmin in a plane below the ramp of snow that leads up to the treasure. Due to unknown reasons, an Anode Beetle's zapping particles can remain in place indefinitely. It is possible for an Anode Beetle to spawn above a gate. For an unknown reason, a Waterwraith can land in mid-air, and after it finishes its landing animation, it falls down to the ground with a bounce. Rarely, a falling Wollywog can crush Pikmin latched on to it. Pikmin may randomly follow an incorrect path in the middle of moving while carrying something. Pikmin that are shaken off by Dwarf Bulbears can appear on the floor above them, if any. The walls next to the 35 Pikmin paper bag wobble. This footage is sped up around 7 times. Click for full-size. ↑ YouTube video showing the invisible walls. This page was last edited on April 18, 2019, at 16:28.